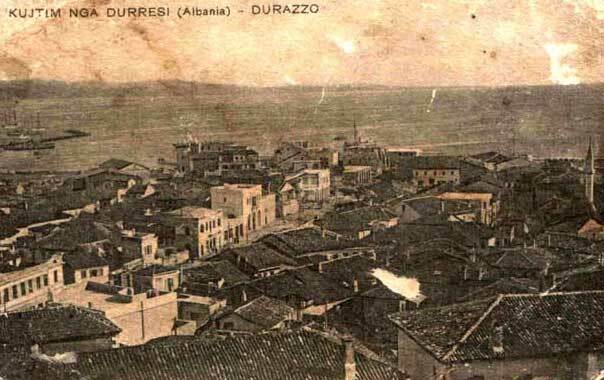 View of Durrës, ca. 1930. (1) cf. R. Elsie: Two Irish travellers in Albania, in: Albanien in Vergangenheit und Gegenwart. Internationales Symposium der Südosteuropa-Gesellschaft..., Munich 1991, p. 24-27. (2) Stephan Urosh III (r. 1322-1333). (3) Romania refers here to territories in the possession of the Byzantine Empire, in particular the Morea, and has nothing to do with modern Romania. The Prince of the Morea at the time was John, Count of Gravina (r. 1316-1335). (4) Robert the Good (r. 1309-1343). (5) The term Slavonia refers here to the Slavic territories of Dalmatia and Croatia. (6) The earthquake referred to Byzantine historian George Pachymeres probably occurred in July 1267.